491 years ago, today, Martin Luther stood up for the truth of the Gospel by nailing his 95 theses at the Wittenberg Church door. 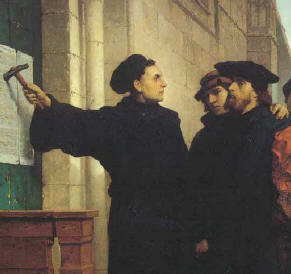 This indeed ignited the popular grass-roots movement that would become what we call today, “The Protestant Reformation.” But prior to the “indulgence” issue, Luther posted a Disputation Against the Scholastics which was the real impetus for Luther’s protest, or at least the underlying theological problem that catapulted Luther to the trajectory that he took. To read more on this see this article by Ron Frost: Aristotle’s Ethics: The Real Reason For Luther’s Reformation? Some folks like Richard Muller protest to Frost’s points, you can see that here. I don’t think Muller deals with Frost’s nuanced points whatsoever, and thus does not specifically undercut Frost’s thesis, and of course neither does Frost in a rejoinder to Muller here. Beyond the debate, I as a Protestant thank the Lord for using Luther, and others to open the doors for all people to have access to the Scriptures in the vernacular. Have a Happy Reformation Day! I like this account by McGill because it seems to succinctly grasp the truth of what Paul is implying. Paul’s view, according to McGill, is at polar odds with the anthropology we find in Genesis 3, and now exemplified in the world today—self-possessed lives. In other words, sin has caused man to violently ‘take’ what is actually a ‘gift’, life. In so doing man asserts his godness, and now must continue to deny his sustenance ‘from God’, in order to assume his place as his own god. The fall-out is apparent, just look at the world, “out there,” look at your own life, and the struggle (cf. Gal. 5:17) that ensues when you try to submit to the idea of ‘life in Christ’ as gift; our self-possessed life (sin-nature) writhes against such thinking. Even so, life is certainly a gift, life in Christ, that is; what freedom this brings, we no longer have to assert ourselves, now we can freely give of ourselves (of Christ) to others, as we have freely received our lives (and continually so, i.e. not static) from Christ! Amen! Karl Barth made the paradoxical distinction, of course, between formal and informal theologians; the former were regular, common, lay people, the latter were those trained in the ways of academia. This post will be focusing on how these two groups, apparently, relate to each other. The Gospels speak of Jesus, and his favorable reception amongst the ‘common people’ who heard Him gladly (see Mk 12:37; etc. ); while the trained theologians, of His day, despised Him (well most of them anyway). One of the reasons the ‘lay’ people listened to Jesus with favor was because He spoke as one with authority (see Mt 7:29, some might think this is primarily referring to His divinity, i.e. who He is, but instead it is referring to a style of teaching [pedagogy] that was popular amongst the Rabbis of His day). What this is referring to is the way Rabbis/theologians typically mused during that day. All one has to do is read a little bit of the Mishnah (Jewish oral tradition, codified in written form), and it becomes quickly apparent what ‘speaking with authority’ is referencing. The theologians of Jesus’ day engaged in a dialogical (i.e. dialogue) practice of disputation and debate; in other words they constantly referred to this ‘leading’ Rabbi, or that ‘leading’ Rabbi to establish their particular theological point. The consequence of such method resulted in a rift between the common man, and the theologian. Theological questions were so complexified, and required so much background knowledge (i.e. what the leading Rabbis were saying), the common man (who just knew the stories of their Torah) felt completely inadequate to think or talk theologically. What Jesus did was cut right to the chase. He didn’t engage in the pedantic squabbles that typically shaped the theological talk of His day; instead He said how it was, he looked at passages of Torah, and said this is how it is (see the Mk 12 context again). Certainly this style of teaching spoke to whom He was, but beyond that, what He was communicating was so undeniably true (and one who knew their Torah could identify this, see the Bereans in Acts 17:11), that any common Joe (even a plumber 😉 ) , could say Amen, amen! I think contemporary theologians (i.e. current, ‘modern’) need to constantly keep the above in mind. We can either be Mishnah theologians, or theologians of the cross (Jesus). Maybe you have read theologians of today, or even of the past, in book form, or now even in ‘e’-form (by way of theo-blogs) who reflect the ‘Mishnah’ style (in Medieval parlance this was known as scholasticism–I mean the method). The result is, that in order to talk theologically, at least the perception goes, a person needs to have the ability to reference any number of what said theologian says here or there. Having said the above, I am not saying that being well read, and well disciplined is wrong, au contraire; instead what I am trying to highlight is that when a theologian becomes well read (which in fact he/she should), there is a tendency to develop a particular attitude. Jesus did not necessarily chastise the so called Mishnah style theologian for his teaching and thinking style; instead He chastised him for the attitude that, often times, inextricably accompanies such thinking/teaching styles (see Mt 23). Whether you fit the common category, or the trained we should all be theologians of the Cross! Whether you are conversant with all the modern theologians, or only know John 3:16; we are all admonished to walk with an attitude that Christ instantiated at the cross (which was indeed driven by who He always has been in eternity—humble). So that we never look at theology as an end in itself, and get caught in that Mishnak circle of death; this goes for all. 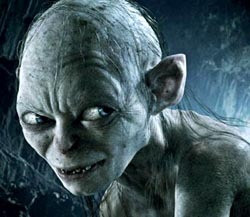 As a trained theologian we can look at the common man’s theological concerns as rather petty; and the inverse can be true as well, as a common man can look at the ‘trained’ theologian as petty and living in an ‘Ivory Tower’ who is so abstracted from ‘reality’ that he really only has things to say to the others inhabiting his/her tower. The theology of the cross squashes both attitudes, we would all do well to take heed.